Feminist art activists Guerrilla Girls have launched an ''anti-billionaire'' campaign highlighting wealth discrimination in the art market. 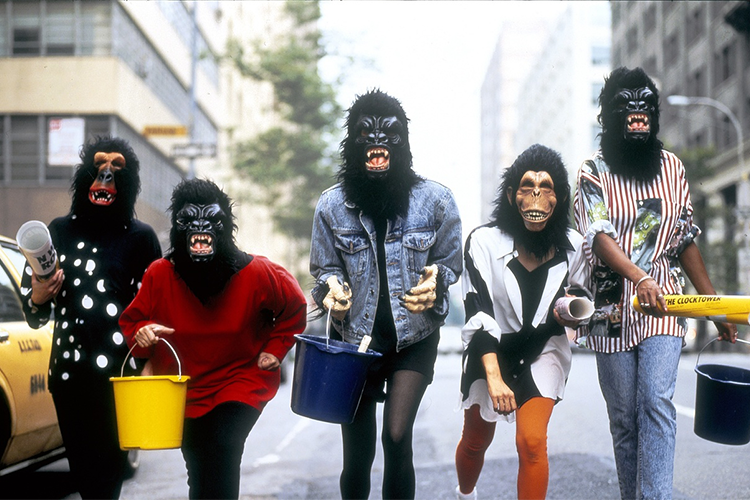 The Guerrilla Girls, who turned 30 this year, are planning a take over of Minneapolis-St Paul in 2016 as part of their campaign. They will execute ''stealth projections'' similar to that of which they projected on the walls of the Whitney Museum of American Art this year that stated: "Dear art collector: art is sooo expensive, even for billionaires! We totally get why you can't pay all your employees a living wage #poorlittlebillionaires." From February 29 to March 6 2016 the Guerrilla Girls Twin Cities Takeover will take place which will feature 20 art institutions as part of the campaign. The Walker Art Center will display protest posters created by the Guerrilla Girls between 1985 and 2012 which the museum purchased in a portfolio of 88 posters this year. The activate artists will also launch ''street actions'' which are set to involve hundreds of other artists. The group commented on their reasoning behind the campaign: "White males still make almost all the money." "Women and artists of colour are here, empowered, and have all the skills and talent necessary. It's the institutions and the billionaires behind them that must change. Museums have to figure out how to move away from the present market model for collecting art or they risk becoming irrelevant." "Get ready to see some change."